You must be logged in to play the court reporting games. You may sign in to the left, or create a new account. Sometimes you just need to have a little fun! So we've created 3 "time wasters" with the court reporting community in mind. Get Sammi Steno Machine to the RPR exam! Ask the Sacred Steno Machine. It knows all! Destroy our virtual steno machine 8 different ways! 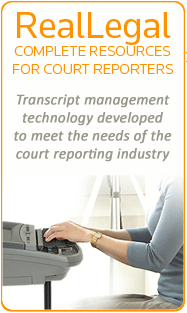 Access over 650,000 court reporting briefs! Enter a word or phrase - press the FIND button. Get that court reporting brief you've been looking for. Tired of hopping from website to website to find quality court reporting information? We've compiled a list of resources for you in one central location. Over 650 videos related to court reporting, including exclusive 4-voice dictation. No more searching - all of your court reporting videos are right here! The SimplySteno Flash Cards take things up a notch! Simply load one of our premade lists, select a speed and start writing! Looking for a deal on court reporting items? Leave the searching to us! We've compiled all eBay items by key search terms to save you time. Marc Greenberg launched StenoLife in 2003, providing a central location for court reporting students, teachers and working court reporters to gather and exchange information. Before that, Marc launched SpeedBuilders.com, an online website for dictation. From there, he moved to RPRprep, CSRprep, and eventually his own online teaching program, SimplySteno. Have you heard about the court reporting documentary? Is there such a thing as too much court reporting information? No... and yes! The problem isn't the amount - the problem is the location. All that great court reporting information is spread out all over the internet - little nuggets of information everywhere! StenoLife has condensed all that information into one simple source. We update daily, so we hope you visit often.